Momma Told Me: School Break Blues? Throw An Unbirthday Party- Ideas Inside! School Break Blues? Throw An Unbirthday Party- Ideas Inside! Momma Told Me: You never need an excuse for a party. Growing up in Southern California there was always plenty to do on school breaks and vacations. We were never much further than an hour's drive from downtown Hollywood, the beach, or numerous theme parks. From the earliest available age to ride the rides at Six Flags Magic Mountain (which was earlier than most kids, as I was tall for my age), and 6 consecutive summers, my father bought season passes each Summer. Almost once a week we would make the 40 minute drive and spend the entire afternoon at the theme park, just him and I. And, every Summer, we would celebrate our own little tradition- we would tell the server at the Moose Lodge restaurant, inside the park, it was my birthday- my unbirthday. The staff would come out singing, I'd get a pair of straw glasses, and I'd enjoy a heaping scoop of ice cream. These fond memories of my father and I celebrating the absurd Alice In Wonderland reference are some of my brightest childhood recollections. As a kid, 'magical' is often the unexpected, and that includes doing things that are just plain silly and for no reason at all. Last Summer while I was watching Sabrina and her step-siblings I announced that we were going to throw an 'Un-Birthday' party. There was some confusion at first, followed by statements like "But it's nobody's birthday!" or "With just the five of us? A party with just us?" Of course I chuckled- even at 3, 9, and 11, these kids were already in the mindset that 'celebration' could only happen with an excuse! Even though there were only a handful of us actually participating in this party I was sure to stock up on all the essentials- hats, streamers (which were a big hit in 'decorating' the house), balloons, and more. When you get kids involved in the preparation, because it is for a 'party' they are naturally motivated to help, and even learn responsibility skills. 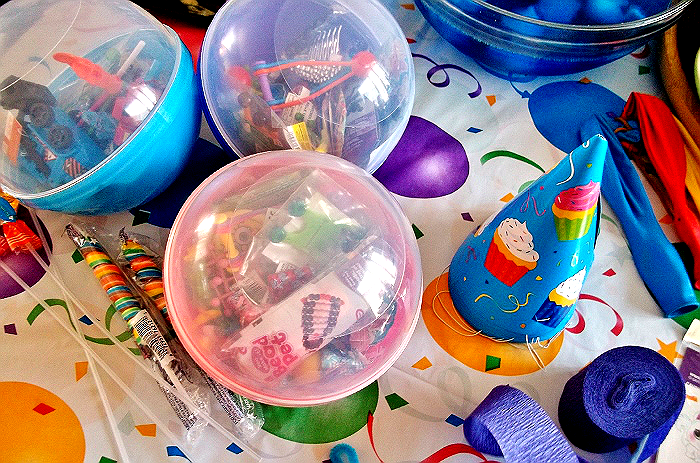 A party is work, and it's a great lesson the next time a birthday rolls around. You can also work on money skills and give each child a small budget at the dollar store and have them create a list of items needed. Can they use compromises to get what they want AND what they need? Of course throwing an Unbirthday Party is also a delightful way to play around with those Pinterest ideas you've been dieing to try. You know, the board full of things that 'look cool' but you're not sure you can really execute them. 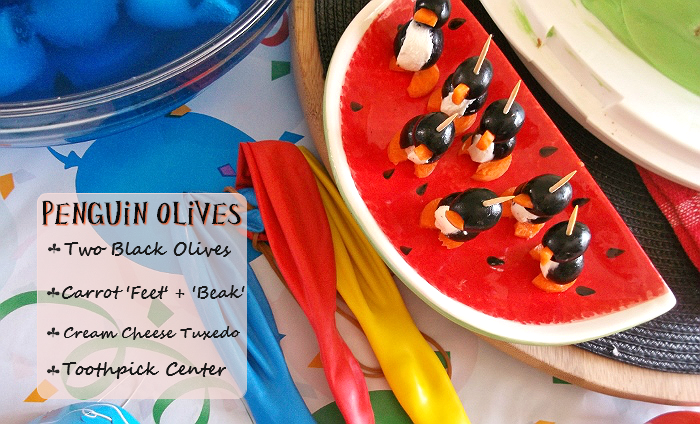 With such an intimate roster of guests, there's no pressure- if those Olive Penguins don't come out photo perfect the hungry kids won't know the difference! When I planned this party it was not intended for a blog post- notice how the photos have heavy direct light? I was too busy partying to stage photos! Of course every party deserves a cake- and this is the perfect time to use boxed cake mix to create something new or fun. 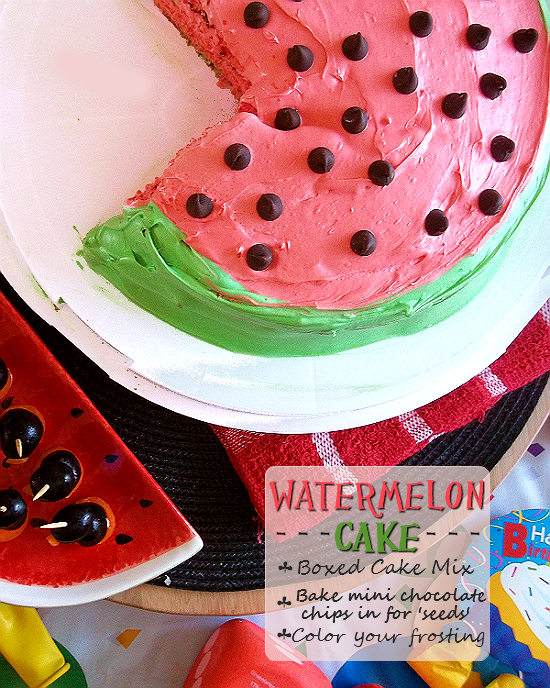 Try making a 'tie dye' cake by separating the batter and coloring it. Make cupcakes each 'guest' can frost then put together for a cupcake cake. Allow your young party-planners to put those gold sprinkles next to the coconut and fruit chews as decoration. Go wild and have fun. Yes, you can even have a 'cake fight' in the backyard- it's an Unbirthday Party, ANYTHING goes! Our Unbirthday Party was a smashing success and lasted an entire afternoon- From face painting with dollar store face crayons to temporary tattoos, pin the flag on the ship, tag, goodie bags, and more. Our budget was $40 and it was well worth the entire week of activities and cherished photo memories. One of the biggest hits? I let the older kids blow up latex balloons with supervision as I set up the party table. 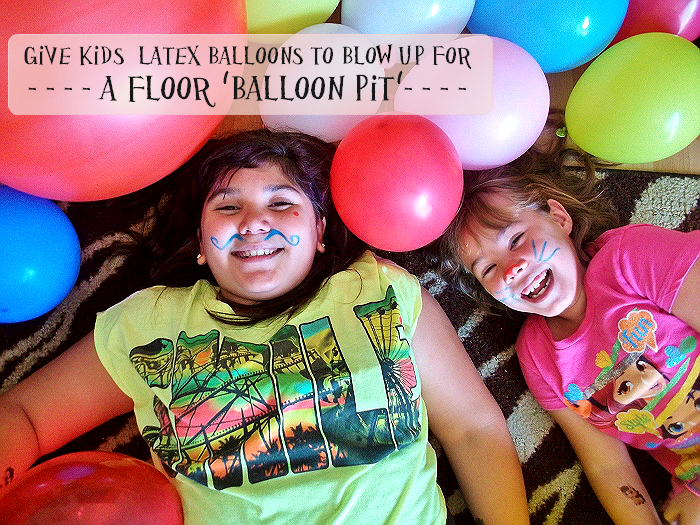 We threw them all on the floor so the kids could kid through them, toss them in the air (volleyball style), or roll in the faux balloon pit. If you've never had an Unbirthday Party- isn't it about time? 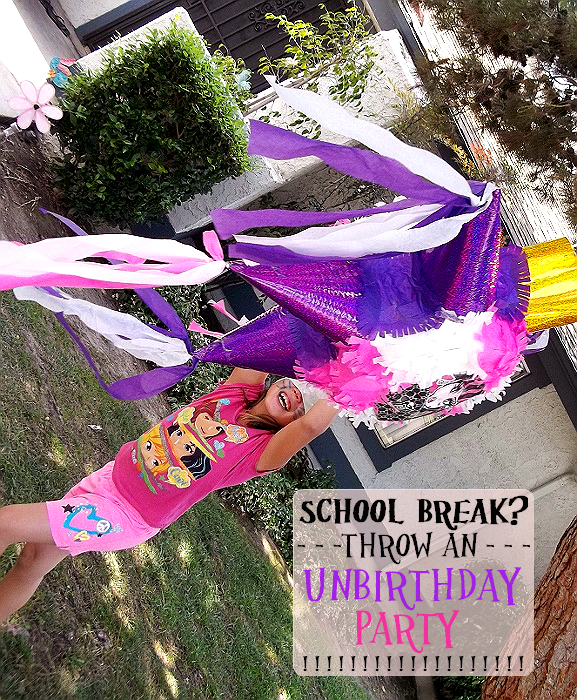 What Daughter Said: This school break, consider throwing an Unbirthday Party, and get the kids involved! I love the Sushi Krispies! So cute. Seriously you are so creative! 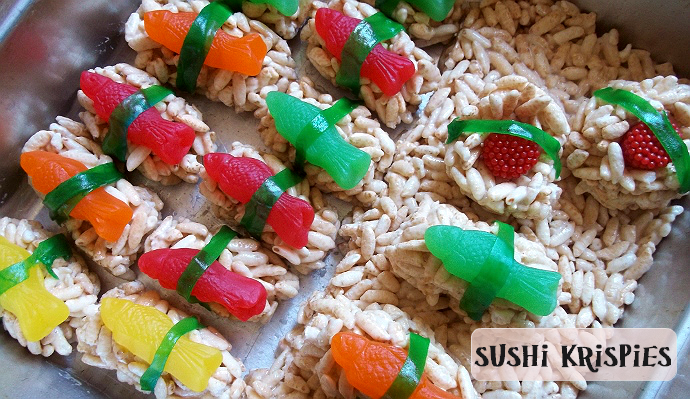 I can't get enough out of those sushi krispie treats! Those are awesome! What a fun idea - and two parties a year this way, eh? I love the sushi crispies. And that cake is gorgeous. My goodness you are CRAFTY, this party looks awesome! What a fun idea. We will be going away for our spring break, but it's good to have back up plans if it rains. 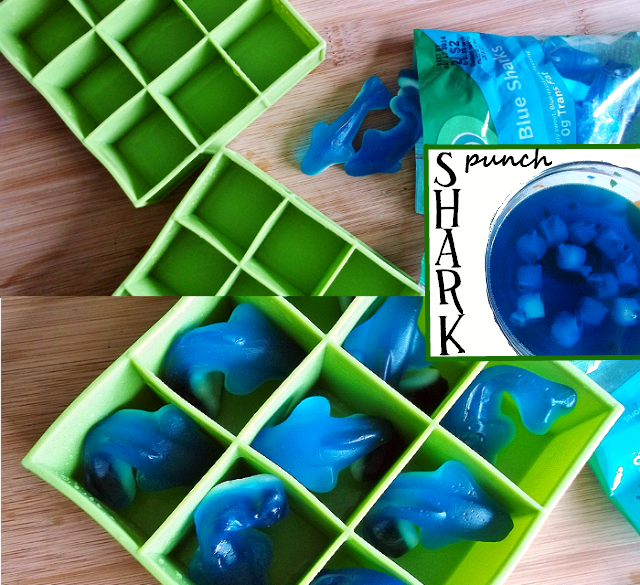 These are some great ideas to have handy for any party. The sushi is adorable - I am going to try that for my little sushi-loving daughter. My friends threw me an unbirthday party once, it was so much fun! You're so creative! I would never think of making those snacks either. I would totally love something like this as a kid or an adult! I wish I could hire you to just host fun parties all the time lol. So much fun!! I love all your party treats - they are adorable! Now I want to have our own unbirthday party! Can you come to my house and make a party for me?! LOVE that sushi idea! Too cute! Great ideas! So many cute ideas! 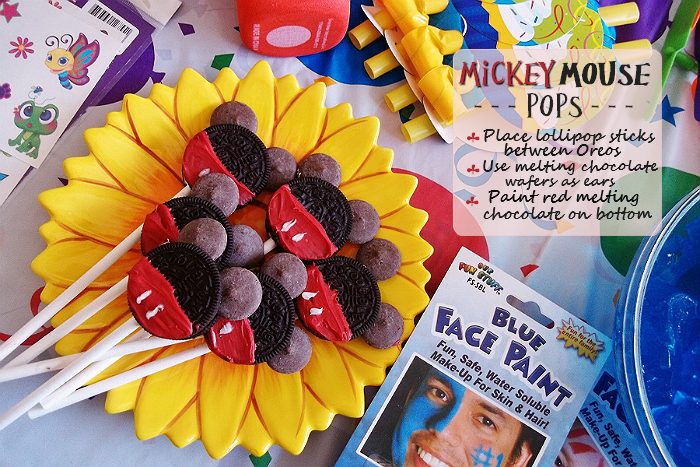 I am going to make those mickey mouse oreo lollipops for my daughters birthday party in may. Those are such fun and creative ideas! I just have to share them with my Pinterest followers! !